A Papaya is a kind of fruit found in Isle Delfino, and on Earth in the tropical regions of the Americas. It appears in the game Super Mario Sunshine. It is a fruit that Yoshi can eat. When Yoshi eats the fruit, he becomes Orange. 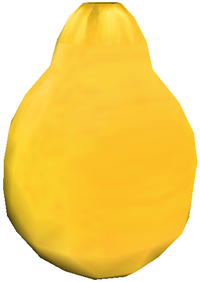 He can spit orange-colored Juice, and it has various effects on enemies. In the Super Mario World episode King Scoopa Koopa, papaya fries were served at Koopa's fast food stand. This page was last edited on August 14, 2018, at 18:45.